* Zinc Finish Finish Custom Grade 10.9 Heavy Duty Bolt kits for 78-02 GM G-Body and F-Body Vehicles. We are proud to announce the latest line of Custom Grade 10.9 nuts and bolts. Replace those Weak Factory Nuts and Bolts and Immediately Double the Strength and safety of your vehicles Lower Control Arms. Eliminate any chance of Flex or Deflection, that always occurs when you upgrade your lower control arms to better quality bars and bushings no matter what Brand of control arms. Our Quality & Finish will leave you with a grin from ear to ear as it is the Best looking unit available for your American Muscle Car. Quality Construction: Grade 10.9 Metric hardware for your rear suspension. No one else gives you the bold clean styling of our Aftermarket Dress Ups, Suspension and Performance Parts for your American Muscle Car like UPR Products! Installs in 30 minutes or less. Fits these Vehicles: 1978 1979 1980 1981 1982 1983 1984 1985 1986 1987 1988 1989 1990 1991 1992 1993 1994 1995 1996 1997 1998 1999 2000 2001 2002 Buick Regal Grand National GNX Chevrolet Monte Carlo El Camino Malibu Caballero Oldsmobile Cutlass Pontiac Grand Prix Grand LeMans Bonneville Camaro Z28 SS Firebird Formula Firehawk Trans Am. Made in the USA! 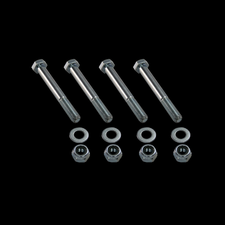 Custom Grade 10.9 Heavy Duty Bolt kits for 78-02 GM G-Body and F-Body Vehicles. We are proud to announce the latest line of Custom Grade 10.9 nuts and bolts. Replace those Weak Factory Nuts and Bolts and Immediately Double the Strength and safety of your vehicles Lower Control Arms. Eliminate any chance of Flex or Deflection, that always occurs when you upgrade your lower control arms to better quality bars and bushings no matter what Brand of control arms. Our Quality & Finish will leave you with a grin from ear to ear as it is the Best looking unit available for your American Muscle Car. Grade 10.9 Metric hardware for your rear suspension. 1978 1979 1980 1981 1982 1983 1984 1985 1986 1987 1988 1989 1990 1991 1992 1993 1994 1995 1996 1997 1998 1999 2000 2001 2002 Buick Regal Grand National GNX Chevrolet Monte Carlo El Camino Malibu Caballero Oldsmobile Cutlass Pontiac Grand Prix Grand LeMans Bonneville Camaro Z28 SS Firebird Formula Firehawk Trans Am.